Got a damaged TV Antenna? No problems, your local Jim’s Antenna’s technician will get it repaired and back working fast. Just call 131 546 for an obligation free quote or Book Online 24/7. TV Reception and Antenna Problems? 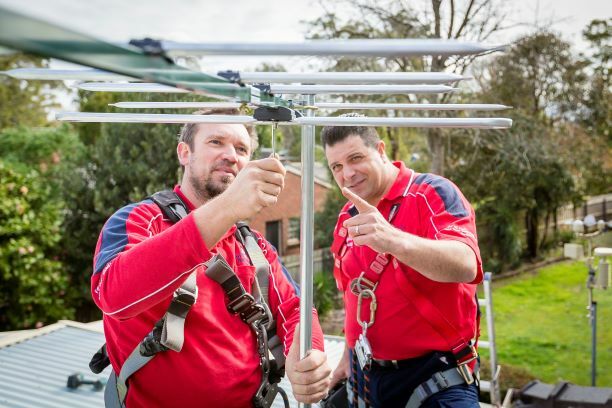 If you’re unable to resolve your TV reception issues Jim’s Antennas will do a full assessment of your current antenna system and diagnose any reception problems using specialised equipment. There are many causes of poor TV reception. This could be cabling, splitters, connectors, amplifiers, incorrect installation or an antenna that has moved off alignment. Storm damage to TV Antennas is common also, especially during electrical storms. High winds can damage antennas and heavy rain can cause shorting and other issues. If it is an antenna repair you require, our technician is able to assess and provide you with a free onsite quote accordingly. In most circumstances our technician is able to fix the problem for you on that very same day – it means you’ll be enjoying your favourite TV shows with perfect picture clarity and no more annoying drop outs. Call us today on 131 546 for a free quote. We’re also part of the trusted Jim’s Group network, which means we are fully insured, qualified, police checked and experienced, while all our products come with industry-leading warranties. If you’re sick of poor TV reception allow us to analyse and resolve your antenna issues once and for all.